My girlfriend Sandi had a very eloquent blog post recap about the Cayuga Trails 50 and putting things in perspective. The week going into the race was a lot harder for her than me given how low her iron stores have been and the fact that she had an operation done a mere 4 days before the race! But Sandi also writes about how our finishing places and times are just numbers that don’t tell the real story behind the scenes; the processes that we all overcame to cross the finish line (regardless of place or time). She goes on to mention that we don’t know the backgrounds and stories of our fellow runners who may have just worked a 60 hour week or are going through a divorce. But we are united by the joy of the struggle that it takes to complete 50-miles with 8,000 feet of vertical gain and hundreds of stone steps. 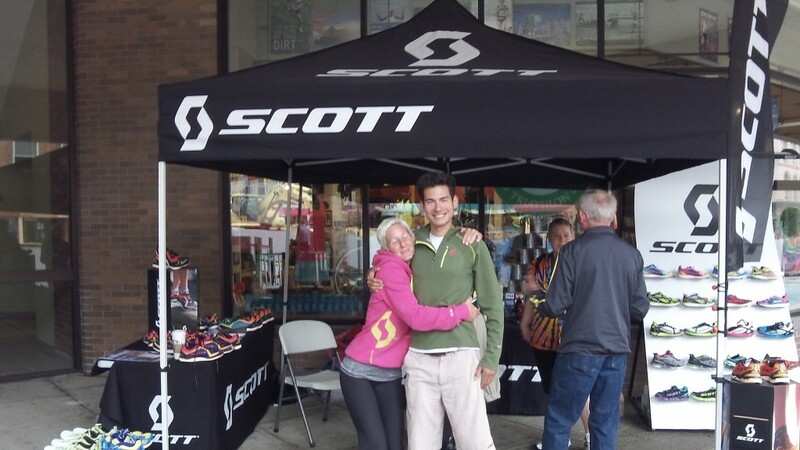 The day before the race representing SCOTT shoes with local rep Tanya Wildonger! At mile 33 I was 90% sure I was going to drop from the race. I had about a 3-minute lead on the field and reports from iRunFar declared that I was looking strong and poised. The fact of the matter is that I was running on the edge of bonking and my hamstrings were rigid and tight. Like most 50 mile races I’ve experienced, I was in a state of fairly intense fatigue and pain already from the first 20-miles. A large rock in a rather shallow river crossing at 33 miles almost put the nails in the coffin that surrounded my desire to even finish the race. My SCOTT Kinabalu trail shoes worked great to get me through the muddy sections and slick sets of steps, but when I clumsily ran right into a large rock in the river I prompted tripped and banged my knee. The impact caused me to twist around in pain and land on my back so my shoulders were engulfed in the stream. As I lay in the water for a couple seconds I thought back to my first ultra, the Chuckanut 50k when I earned 5 stitches for falling on the very same knee. At about the same instant my hamstrings seized up and I yelled out-loud in pain from such a debilitating cramp. I’m glad nobody was around to witness this spectacle because I’m sure it would’ve been quite a show! As I walked up the bank of the river and into a little hill on the trail my mind got negative. I thought about how I was dizzy and how my knee surely would need stiches (there was a bit of blood running down my leg). I thought about how I’ve been racing too much this year already and that my legs needed a break before Mt. Washington anyway. I convinced myself that at the very next aid station I’d throw in the towel and call it a day. Problem was the next aid station was a good 3-4 miles away. It was going to take a long time to walk there! I took my last gel and decided that maybe I could muster up a slow jog…that way at least I won’t be caught by too many people before I DNFed. I started thinking about the $2500 prize for winning the race and how a $0 payday would really hurt my yearly income (when you run for a living you rely a lot on prize money from races!). I thought about how disappointed I was after DNFing at the North Face 50 championships in San Francisco I thought about my girlfriend and her sister still out there competing on the course and all the runners who started with much harder circumstances.. Suddenly after about a half mile I felt like I could pick up the pace…I went from a walk to a jog to a run! I may have been on the edge of bonking, but I knew that last gel I took would start kicking in in another 5-10 minutes. The blood on my knee got washed away from the river and rain water and there was merely just a little scratch…nothing that would require stitches! (I’m not a total wuss as it is still quite bruised though). If my hamstrings would cramp up again I would just have to stop and stretch (something I ended up doing about 5 more times)..plus, maybe the salt from more Terra chips would help! This shift in perspective was all it took for me to continue onward. I think if the aid station was near the scene of my fall I may have dropped at that very point in the race when my thoughts were at their darkest. Meghan Hicks of iRunFar.com later asked me: “Did the physical manifest the mental or did the mental manifest the physical?” I replied that I thought the physical pain of the fall and cramping was what made my thoughts turn so negative. Generally I try to take the mental aspect of distance running totally out of the equation by just focusing on the physical: If I’ve trained well and my body is ready then it can perform a specific task..hopefully. However, one cannot deny the inevitable connection between brain synapses, leg muscle fibers and (most importantly) the heart. The perception of pain seems to change with different body systems and in the hundreds of distance races that I’ve competed in there are only a handful where I can say that I willed myself to go 100% into the deepest and darkest amount of pain that my body could handle before it actually totally failed (this seems to be a little easier to do in shorter races like the 800m when you can merely lock yourself up with lactic acid). Learning to combat the fatigue of racing an ultra is still a continual process for me, and little “mental tricks” like breaking the distance into smaller segments, or just focusing on the current situation at hand can make the difference between finishing or stopping at 33 miles. 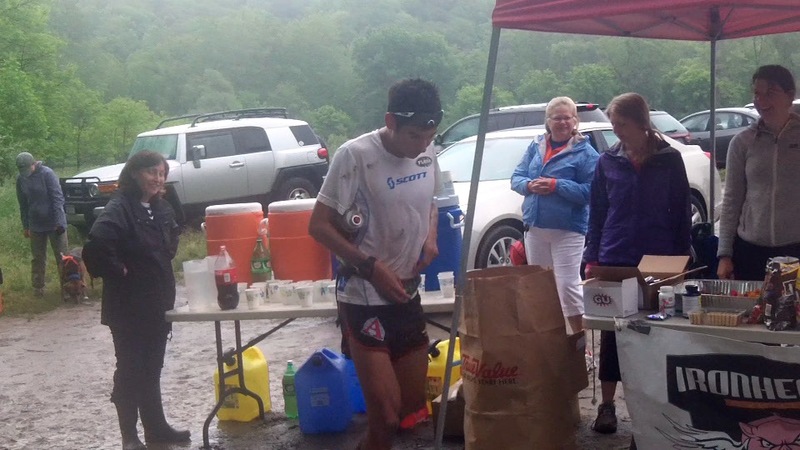 In the end I was able to re-establish my 5 minute lead and pull off a win at the inaugural Cayuga Trails 50. Thanks to the hard work of RD Ian Golden there was a very generous prize purse that will help Sandi and I pay rent in Colorado, train at a higher level, and purchase more healthy food. But the end result (my slowest/worse 50-mile time by 30min btw) doesn’t really matter as much as the process that it took to get there. 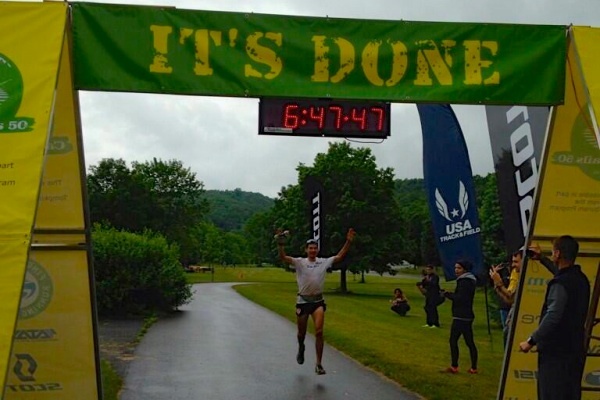 The drive up from Cleveland with the support crew of Steve Hawthorne (Vertical Runner in Ohio) and Rachel Nypaver, the support from RD Ian Golden, funding and gear from my Sponsors, and the support of the ultra-trail running community (fellow runners like yourself) are what made this race possible. Everyone toed the starting line with a different background story (some filled with more challenges than others), but after running through lush wooded forests, up and down rocky steps and through gorges with magnificent waterfalls, we all shared a new experience. I believe the more of these experiences we have the more challenges we face; the more challenges we face the more creative solutions we gain in our toolbox of solving problems. I believe that that in itself leads to a more enriching life. Running may be an escape, a hobby, or a “job,” but the passion behind training for these experiences, the camaraderie of fellow runners, the physical and mental challenges one must face, and new perspectives that can be gained surely make it infused in one’s life style. 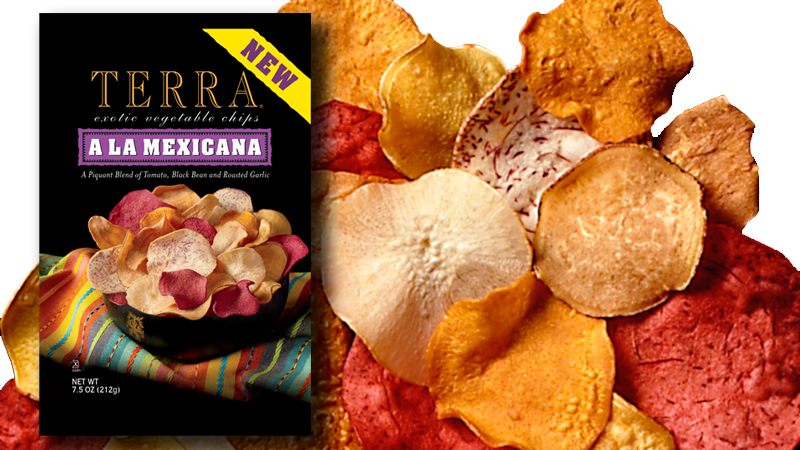 If that lifestyle involves some Terra chips every now and then (as well as some beer) then I’m all in! Your best race report yet in my opinion. I really admire the way you thought about and acknowledged what other runners went through in the build up to the race. Good luck at Mount Washington.. I got to witness your amazing win there last year! I hope the weather is the exact same! Hey thanks! Best of luck with your training and racing as well! Congrats on a great win (and CR, of course) for you and your crew. It’s inspiring to see generosity, grace, and genuine character be in healthy supply amongst ultra running’s elite. Your providing endless motivation for a back-of-packer like myself to keep pushing when things seem hard, to keep positive, and to possibly even try some scary fish-flavored chips to boot. Good luck @Mt Washington- and hope you get some well deserved rest & relaxation after this ridiculous and amazing spring stretch…we want a healthy Sage for the whole year!! Thanks CJ! I was really hurting at Mt. WA. 4700′ of vert is no joke! Hey thanks for the support! It was a very painful race and looking at my watching comparing my splits to last year also made things hard. Best of luck with the lottery – it’s really a one-of-a-kind type of event and very special! Excellent description of the struggle you went through – it answered some questions I had, namely how did you back get so dirty?! Take care on the trails those “little” tumbles can amount to major injury as I’m sure you know all too well. Stay strong Sage! I have been looking more and more in to the importance of nutrition to fuel my competitive running, and I noticed you seem to have experience and knowledge in this area. What are some of your go to foods that you enjoy eating on a regular basis? Hey, I eat a lot of avocados and tons of veggies (I’m vegetarian). I also like beans, rice, pasta, pizza and beer (Avery). Sage, you ever experiment with gluten free? I don’t have gluten sensitivities but I gave it a go for a month just to see how my body responded. It was strange in that my recovery and daily energy levels seemed to improve slightly, but my energy levels during exercise went down (likely due to the lower carb diet). So eventually I settled on a reduced gluten diet, after all I love pizza! Good luck in your races, hope to see you on the Boulder trails this summer. Hey thanks! My girlfriend Sandi is gluten free so I’m eatting a lot of gluten free meals. I’m still pretty high carb though. I think wheat is overdone in a modern western diet (As well as dairy) but I love beer and pizza too much to totally give it up. Just eat a lot of fruits and veggies too! I managed to cook up another question for you, do you have a weight lifting regimine? and if so what is it like? if you dont want to reveal all of your secrets I understand but what is it along the lines of? and did you lift with Hansons Brooks? I basically haven’t touched a weight since college. Most of the guys at Hansons-Brooks didn’t lift although we had access to a gym. However, as with high school and college (and Hansons) I’ve always done a lot of sit-ups, push-ups and even some pull-ups. In college I did some upper body lifting (benchpress, lat pull downs, free weights etc) but that was out of vanity. I think weight lifting has a time and place for injury prevention/core strength but now I mainly focus on just running more.